Annnnd just like that – we are almost at the weekend. If we stand on our tippy toes we can almost see it! Today I wanted to share a quick recipe with y’all before I run off to give a presentation on The Basics of Simple CLEAN Eating. I love giving these presentations, because they force me to step outside of my comfort zone (public speaking was never my strong suit), and the energy that gives me is so motivating! I love switching up every so often and be able to reach a mass of people at one time! So fun! I knew today was going to be a bit of a hectic morning, so I made sure that my breakfast was prepped and it was something that was going to keep me fueled and focused! Like I mentioned in my Instagram post from Tuesday, I used to eat chia seed pudding almost EVERY morning when I would train early mornings and was a bit more “on the go”. 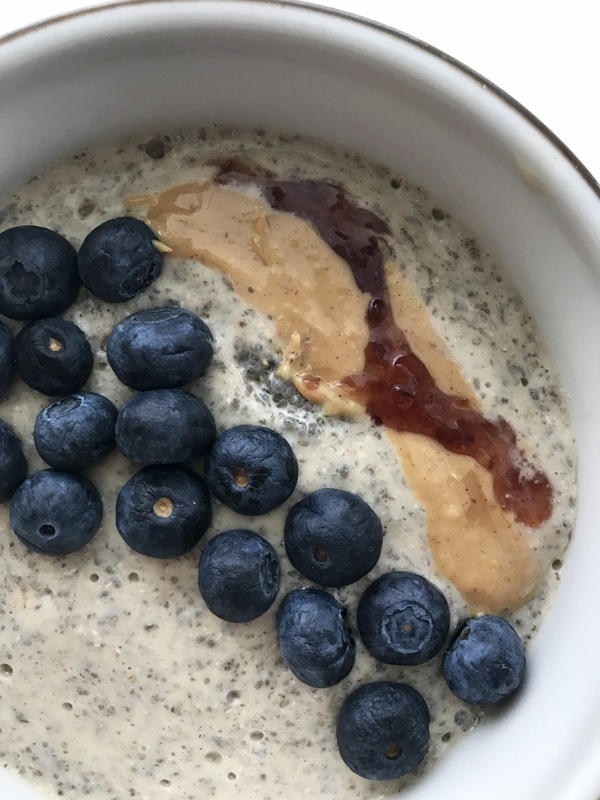 I loved the way that the good healthy fats and fiber from the chia seeds kept me full without the bloat that I sometimes experience from overnight oats! Plus they’re so easy to prep and very portable! Plus, I love that you can change the flavors and toppings up so easily, so you don’t get bored. Last night I prepped my pudding a little differently. Using the blender this time to change up the recipe a bit and BAM! The first bite brought me back to my childhood. It changed the texture to a more Cream of Wheat – like consistency. Which I LOVED growing up. SO GOOD! Today I went with a PB & J Chia Seed Pudding and the result was super tasty! Give it a try! Place it all in a blender and mix it up! Pour into a dish with a top and let sit in fridge overnight or a couple hours. In the morning, heat it up for about 1 minute, then top with blueberries, strawberries, drizzle of PB and some low sugar jam.